Welcome back to the United States from an exciting semester abroad! Now that you are back from studying abroad, do you find yourself talking about your experience all the time? The Center for Intercultural and International Programs (CIIP) has the perfect opportunity for you. We have program called the Study Abroad Student Ambassador (SASA) Volunteer Program. This program utilizes your study abroad experience and enthusiasm to tell other Xavier students about studying abroad. 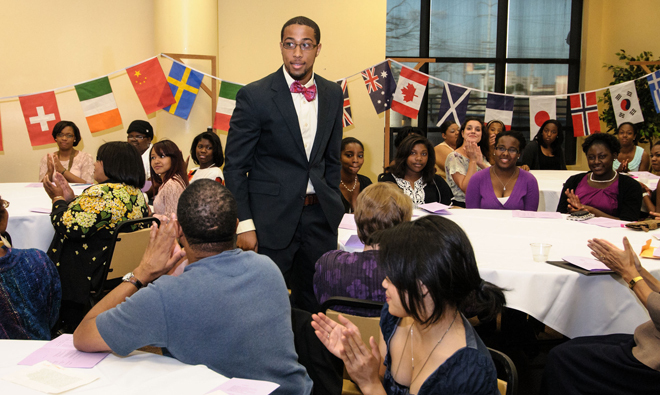 Who is a Study Abroad Student Ambassador? YOU! Any student who has participated in a Xavier study abroad program (semester, summer, and academic year) can apply! What does a Study Abroad Student Ambassador do? A SASA is an CIIP student representative who is trained to speak about study abroad and share your personal experience with Xavier Freshman Seminar classes, admission events, study abroad fairs, orientations and one-on-one conversations with Xavier students. You will also have the opportunity to be part of the Pal Program where you will help international students transition to Xavier. The time commitment will be between 15 to 20 hours per the fall semester and 5-10 hours per the spring semester. If you are selected as a SASA the CIIP staff will provide you with the training related to the content of the presentations and general Xavier study abroad information. You will also receive practice time and feedback on effective public speaking by the CIIP staff. This training generally takes place the week prior to fall semester classes. This is a one year commitment with the majority of the training and presentations taking place during the fall semester. CLICK HERE for an application with short answer questions. Applications must be submitted by September 7, 2018 for the 2018-2019 academic year. Application review will begin after the application deadline. In-person interviews may be conducted in September. Notifications will be sent out in September. Training sessions for the 2018-19 SASAs will begin in September. If you have questions, contact Ms. Karen W. Lee (Associate Director for the Center for Intercultural and International Programs)at kwlee@xula.edu or (504) 520-5491.